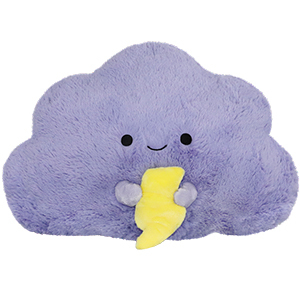 Squishable Storm Cloud: An Adorable Fuzzy Plush to Snurfle and Squeeze! The storm is raging above your house! Thunder thunders! Lightning lightnings! Rain rains! But not to worry, you're warm and cozy, cuddled up under a comforter, sipping a mug of hot cocoa in front of a toasty fire! It might seem like this Storm Cloud would prefer to join his louder cousins outside, but no! He wants to snuggle up with you...and maybe share your cocoa! Truth! Ah yes, a soft, cuddly, physical effigy of my depression the size of a bed pillow. Obviously, I had to buy it. The cloud is RIDICULOUSLY soft and fluffy, colors are true to size. It's not lumpy or limp like so many large plushies out there are: this guy is firmly packed with whatever fiber they're filled with so he should hold his shape for a long time. The cute little lightning bolt's edges and points are well defined and firmly attached to the cloud's cute little hands. Overall great quality, and I'm willing to shell out a few extra bucks over what I'd be charged in a general retail store for a plush of the same size if what the FAQ page says about paying the factory workers fairly and maintaining good work conditions at their facilities. Why four stars then? An issue that I saw a lot in the reviews of different squishes: he's SO FLUFFY that the fluff gets in the way of his cute little face. And though I knew he'd be about 15", the images always seem to make the plushies look a good deal larger than they are, which is a bit annoying. Still I think I'm hooked. I will absolutely be getting another squish at some point, and I have NO regrets at all (and I'm a super frugal shopper's remorse sufferer usually) on treating myself to this charming cloud over the holidays. I bought this stormcloud as a gift for my boyfriend. He came today in the mail. He�s cuter in person and very fluffy! My boyfriend was very happy to get him. I have well over 100 15� squishables and this immediately became a new favorite. When you aren�t having the best day, the storm cloud is there for you and knows how to cheer you up! This squishabpe is a perfect reminder that not all days are perfect but that you can always get through it! Okay on the picture it was cute, but in person, OH, WOW, FABULOUS! It is possibly the softest thing I have ever felt in my entire life, continue making these forever they are beautiful creations. Everyone should buy them, yes okay stay wonderful everyone who makes squishables. Stay wonderful.